"For me, this isn't about the party, it's about the people." His official campaign for U.S. Senate was barely two days old, and already Joe Sestak was working on a big bipartisan project. On March 6, he was walking west through Bucks County as part of a 422-mile trek across the state to "walk a mile in the shoes of Pennsylvanians." "I came across a car that got stuck in the snow while trying to get out of the driveway and I had a tracker with the [Republican U.S. Sen. Pat] Toomey campaign following me and I said, ‘Come on, we're going to get them out,'" Sestak told City Paper minutes after the event. "It took us 25 minutes, but we did it. I high-fived him and yelled, ‘Bi-partisanship!'" Sestak doesn't just want to practice this spirit of cooperation on a snow-covered highway; he wants to take his act to Washington, D.C. In 2010, after defeating 30-year incumbent Arlen Specter in the Democratic primary, Sestak came within two points of beating Toomey, the fiscally conservative Republican favored by the tea party, that November. Now Sestak wants to take another run at Toomey, but the path to November's general election might not be an easy one. Last month, National Journal ran an article detailing the state Democratic Party's efforts to find a different candidate. "If Joe Sestak is the nominee in 2016 for U.S. Senate, we will once again lose to Pat Toomey," former state party chairman T.J. Rooney told the Journal. But running without the support of his party is nothing new for Sestak, the progressive Dem, former Navy admiral and U.S. Congressman. The party was firmly opposed to him running against Specter in 2010, after the 30-year incumbent switched his party affiliation from Republican to Democrat to avoid a primary battle with Toomey. Specter was miles ahead of Sestak just a month before the election. But Sestak ran a solid grassroots campaign, closed the gap and defeated Specter. 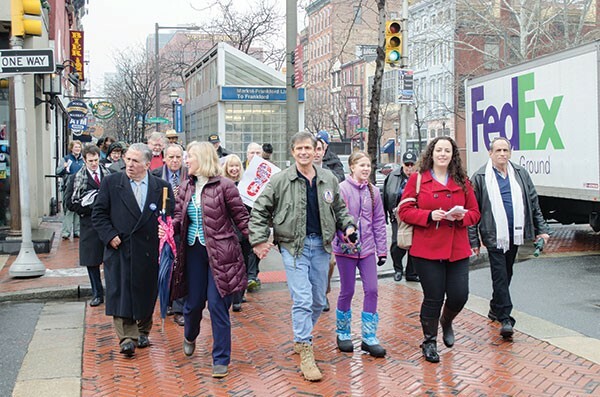 Joe Sestak kicked off his walking tour of the state in Philadelphia on March 4. It's still unclear whether Sestak will have a primary challenger in May 2016. But right now, he's not concerned about that. Right now, he's walking across the state to meet voters, hear their concerns and rebuild that grassroots support that served him in 2010. Sestak talked with City Paper about his campaign, Toomey's record and his relationship with the state party while walking through Bucks County on March 6. What gave you the idea to kick off your campaign with a cross-state walk? As I've traveled across Pennsylvania in recent years and talked to people, I realized that the biggest deficit that we have is a trust deficit. I thought, "How can I demonstrate that Pennsylvanians can trust me in terms of my accountability; trust me for my deeds, not for my words? Years ago, my daughter drew a picture that I had hanging in my office and it said, "Joe Sestak is walking in your shoes." ... So when I started this, I thought, "I can do this literally." It started [March 5] walking in veterans' shoes. Today I walked figuratively in the shoes of victims of domestic violence and human trafficking. I'm walking 26 miles today because people don't trust their leaders anymore. They say one thing in Pennsylvania and do another when they get to D.C. And that's what this is about. Is that why you decided to take another run at Toomey? I've done more than 400 events in the past two years, and the one question that kept coming up was, "Who can you really believe anymore? Who can you trust?" So remembering how close I came with the biggest funding gap of any Senate race ... that year and knowing that we came that close because of the grassroots support, we thought, "Heck, winning this race is about getting out there and gaining trust," like the captain of a ship. You get out there and you gain trust, and hopefully respect, and then you complete the mission together. That made the difference in 2010. I didn't and won't shy away from who I am and what I stand for. And that's what this race is going to be about.